Your ERP selection process is critical. Enterprise Resource Planning (ERP) software selection and implementation can be a complicated process. But having an ERP strategy in place from the start makes it easier. 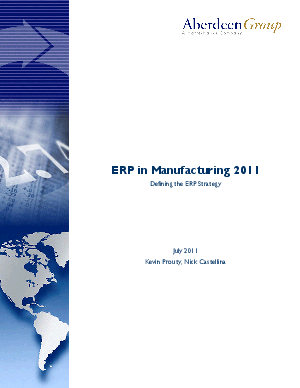 And a good ERP strategy starts with the selection of the ERP system itself. This report focuses on helping your business understand if it's ready for a new ERP system, setting strategy for an evaluation, and how to measure the success of an implementation. View this Analyst Insight Report now and discover how Best-in-Class companies select their ERP system as part of an overall ERP strategy.